I feel pretty confident that most women, at some time, have dreamt of living in Paris. I mean, not only are French women über chic and basically every piece of food is made with copious amounts of butter, but there's also culture and history everywhere you turn. Oh, and the wine. Let's not forget about the wine. After all, France pretty much invented it (err…probably--someone check that, will ya?). And when you put all of those things together, it makes about zero sense NOT to go to Paris, but since that would involve a substantial amount of cash, and the ability to leave your normal life for a while, why not live vicariously through someone else? Enter, Confessions of a Paris Party Girl. The author, Vicki Lesage, is a US midwest native who currently lives in Paris. And, if I may be so bold, I'm pretty sure that, if we met in real life, we'd probably have the best night ever drinking far too much wine and solving the majority of the world's problems. Seriously. Like, war would be over, people. Or, at least that's what we'd do if Vicki weren't currently pregnant with her second child. Haha! But this book is about Vicki's life in Paris, pre-les-bébés. A time when she strolled around the Parisian streets with a confident swagger that would put Kate Moss to shame (only sub in "stumbling mess" for "confident swagger," ha!). And who doesn't love a few shouldn't-have-had-that-last-beer stories? Especially when they have cute French guys and amusing experiences that illustrate just how different France is from The USA. And these are real stories, people, not fiction, which is hard to believe at times because Vicki can get a little crazy. Fun crazy, obviously, but crazy nonetheless. But the most interesting part of the book, for me, was the latter half. Just when I was growing a bit tired of stories involving bars, Vicki meets Mika, her future husband and suddenly, the tone got more mature. Truth be told, I read a couple chapters at a time in the first half, but then read the last half all at once. It may have been the book's shift from hanging out in Paris to staying in Paris permanently that got me more engaged, or the addition of Mika, but for whatever reason, it went from a good read to a great one and when I was finished, I went straight to Vicki's blog to read more. And that's the best part about Confessions of a Paris Party Girl, because if you love it then you can get even more, like, immediately! Plus, Vicki has a new book coming out in May called Confessions of a Paris Potty Trainer so you won't have to wait long for the next instalment. Hint: the answer is VERY! So if you're in the mood for a light, non-fiction read about an American partying it up in Paris and then falling in love, you're going to want to pick up Confessions of a Paris Party Girl. And to take your reading experience to the next level, I recommend having a glass of wine handy. You're welcome for the excuse to day drink. Ha! Thanks to Heather for hosting Book Club Fridays! Finding new books to read is just the best! 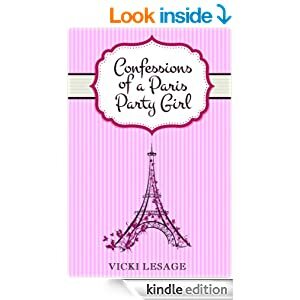 Disclaimer: I was contacted by Vicki Lesage to review Confessions of a Paris Party Girl but because I keep it real, my review is entirely honest. It's a date - let's drink copious amounts of wine and end war. I really can't believe we haven't done this sooner :) Baby #2 should be born any day now, so I'm free when you are! And thanks for the great review. I hope your readers enjoy the book as much as you did! I'm putting this on my list, stat!